(NewsUSA) - If you've spent any time obsessing about photos of your life, business, wardrobe, pet, or the last cupcake you ate, on Instagram, you understand that rush of excitement that comes when "Likes" pop up on your feed. Not only is it downright thrilling, but you can now cash in with Quantum Sponsor. Imagine getting paid just to post on Instagram about brands and local businesses you are interested in. Quantum Sponsor is the platform that's making it happen. Unlike traditional talent agencies, Quantum Sponsor doesn't require you to have millions of followers to participate - even a couple of hundred is just fine! Now, Aunt Suzie, who just started Instagram last month, can make money posting about her favorite new Clutch Coffee shop that opened down the street, and so can you. Both small businesses and Fortune 500 companies alike are using Quantum Sponsor to pay everyday Instagram users for posts. Most consumers today are overwhelmed by and tired of banner-style and traditional ads; they want to learn about products from other trusted consumers who are willing to share their interests and expertise. Quantum Sponsor's new advertising platform pairs enthusiastic Instagrammers with clients who will hire them for paid promotions. Best of all, Quantum Sponsor is easy for both the Instagrammers and businesses. "We want to give social media users the opportunity to earn money for the content they've created and the influence they've earned. So we made it easy. In doing so, we also created an effective, cost- saving tool for digital advertisers across all industries," says AJ Silverman, founder and CEO of Quantum Sponsor. Working with Quantum Sponsor streamlines the process of influencer selection, sponsorship, and payments. 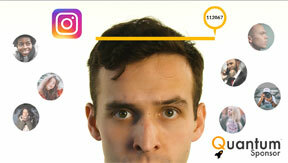 Here's how it works: Instagrammers sign up as influencers on the Quantum Sponsor website. The website will tell them exactly how much money they'll make for posts based on how engaged their followers are. Quantum Sponsor reviews and categorizes all influencers by audience interests, location, gender, and brand safety. Advertisers sign up as "sponsors," and create campaigns directly on the Quantum Sponsor platform, which will automatically send out email alerts and offers to influencers who match with the advertiser's target audience. Influencers post and complete offers by leaving posts active for a minimum of seven days. Once offers are completed, influencers can withdraw their earnings with PayPal. Influencers can increase their earnings by posting interesting, engaging content but need to eliminate cruel or violent language in order to receive offers. Quantum Sponsor recognizes that digital influencers are the future of marketing, the new darlings of the Internet, and that advertisers who want social media followers, depend on them. This creates an opportunity for influencers to cash in while building their own personal brands - just by doing the things they love. Whether it's sewing, surfing, or skin care, there is a potential marketing campaign to fit any interest. For more information on how to become an influencer and get paid to post, visit www.quantumsponsor.com.